Designed to optimize delivery of metered dose inhaler (MDI) asthma medication by providing more fine particle dose than an MDI alone. 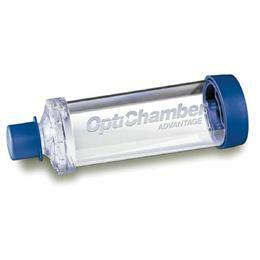 The 218mL-volume chambers provide greater fine particle dose output than other smaller chambers. The detachable face masks are especially helpful in administering inhaler medication to infants, toddlers or other patients who may have difficulty using the mouthpiece. Masks come in three sizes and are also available individually.